I go for weeks at a time eating Greek yogurt, berries, and granola for breakfast. 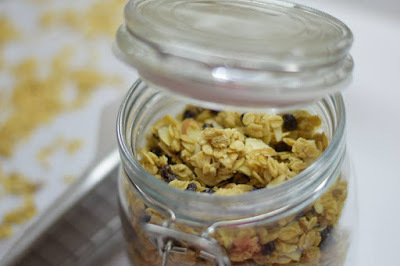 I used to buy granola in bulk, but I recently realized that even the bulk prices are a little crazy, and that granola doesn't have to be complicated to be just as delicious as the fancy-bagged granola at boutique shops. This is a good basic recipe that's easily customized with your favorites. 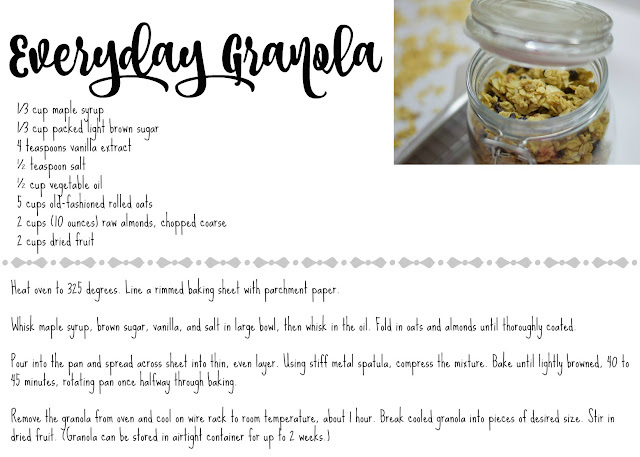 I use slivered almonds because I like how consistent the pieces are, especially given the similar size of the rolled oats. You can use whatever nut you'd like--just chop them coarsely. Heat oven to 325 degrees. Line a rimmed baking sheet with parchment paper. Whisk maple syrup, brown sugar, vanilla, and salt in large bowl, then whisk in the oil. Fold in oats and almonds until thoroughly coated. Pour into the pan and spread across sheet into thin, even layer. Using stiff metal spatula, compress the mixture. Bake until lightly browned, 40 to 45 minutes, rotating pan once halfway through baking.